This page will be dedicated to Enya. Because she is my favorite New Age performer, I wanted to do this for her. For your information, I am borrowing this from another site. Thank You to this person for allowing me to use it on my site. Here is some information that I found on Enya. A small little biography to share with you all. Eithne N Bhraonin - known as Enya - was born in 1961, and spent her childhood in Gweedore (in County Donegal, situated in the north-west of Ireland, one of the main redoubts of the Irish language). There are nine brothers and sisters. Apart from Enya, who is in the middle, there are four other girls and four boys. All the family have won many competitions and are famous in national traditional [music] circles. 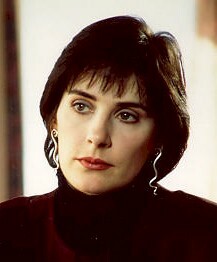 Whilst at school, Enya studied the piano and classical music. Three of her brothers and sisters, Mire N Bhraonin (Mary Brennan), Ciarn Braonin (Kieran Brennan) and Pl Braonin (Paul Brennan) formed, together with their uncles Pdraig Dugin (Patrick Duggan) and Noel Dugin (Noel Duggan), a folk music group (at first with a certain American feel and then more purely Irish, though influenced by jazz and by others such as Pentangle). The group was named Clannad, a contraction of "the family from Gweedore" in Irish. In 1980, at the suggestion of their manager, Fachtna O'Kelly, Enya became a member of the group, participating in the recording of two of their albums, Crann Ull and Fuaim. Apart from providing vocals, she played the Wurlitzer electric piano and later the Prophet 5 synthesizer. She performed with Clannad on many occasions, until, in February 1982, on completing a European tour, she left the group, no one really knowing why. Perhaps she was fed up with being treated as just the little sister. Since then she has lived in Artane, in the north of Dublin, sharing a house together with Nicky Ryan and Roma, his wife, who comes from Belfast. All had been involved with Clannad at some time. Nick Ryan had worked as a sound engineer with Planxty and later with Clannad, at the time the group was starting out. In 1980, their manager, Fachtna O'Kelly, took charge of the new group The Boomtown Rats, for which reason Nicky thenceforth took charge of their [Clannad's] work. In his house he installed a recording studio, Aigle. There he has recorded, for example, Christy Moore's album Ordinary Man, which has three songs in which Enya takes part in the chorus. It was also Fachtna O'Kelly who suggested to Enya after she left Clannad, that she devote herself to composing for films. And so, in 1984, she approached her first important task. Roma Ryan had sent a cassette of Enya to film producer David Puttnam, who already had to his credit such titles as Midnight Express, Chariots Of Fire and Los Gritos Del Silencio. Puttnam asked her to compose dreamy and romantic music with a sixties feel for the feature film The Frog Prince. Having a studio at her disposal, Enya worked almost always at home with the Roland Juno 60 synthesizer or the Kurzweil sampler, and then added piano and voice. Nicky Ryan recorded everything and helped to put the compositions into their final form. The next commission was for the BBC. It was to prepare music for an important television documentary series on the history of the Celtic civilisation throughout its 2700 years. The series was called The Celts. The composition took ten months work. The music was liked so much that the BBC decided to release a selection as an independent record, before the series was broadcast and entitled simply Enya, with barely a mention in the liner notes that it was a soundtrack. She played nearly all the instruments on the album, sometimes doubling up as many as eighty voices to create her characteristic sound, of dense textures, and ethereal voices, dreamlike and enchanting. It was to paint by means of synthesizers a modern sonic landscape that could evoke different atmospheres, from the mournful lament of 'Deireadh An Tuath' to the striking 'Boadicea', with its astounding dynamic of overdubbed voices. Nicky Ryan acted as producer and co-author of the arrangements and his wife Roma wrote nearly all the lyrics, for the most part nearly inaudible or impenetrable, giving an evanescent character to the music by being sung in Latin, Welsh or Scottish Gaelic. This record subsequently climbed to number one in the Irish charts, which started the commercial rise of Enya. She collaborated with the singer Sinad O'Connor reciting a short text on 'Never Get Old' from her album The Lion And The Cobra. She signed with an important multinational (WEA), and had a resounding success with her second album Watermark, which has passed 10 million sales worldwide, and has gone platinum in 14 different countries, helped by the single 'Orinoco Flow', a No 1 hit in Britain. Then she repeated her world success with Shepherd Moons, which spent an amazing 199 weeks on the Billboard charts in the USA and has sold over 11 million copies. A new version of the album Enya was released as The Celts and in 1995 with The Memory of Trees was yet another smash hit album. Enya has been nominated for four Grammy Awards and has won two, both for "Best New Age Album", Shepherd Moons in 1992 and The Memory of Trees in 1997. Also in 1997 she released a compilation album titled Paint The Sky With Stars that contained a selection of the Enya better known themes and two new songs: 'Paint The Sky With Stars' and 'Only If...' That year itself came out A Box Of Dreams; a box set that contained a three CD collection and an illustrated booklet. The CDs were entitled Oceans, Clouds and Stars, and they cover the Enya career since her debut in 1987. In year 2000 Enya returns with a new single "Only Time", and her first new studio album in five years, A Day Without Rain. Of this album she says, "The title refers to the mood on a particularly peaceful day on which there was no rain. We do get a lot of rain in Ireland in all seasons. We had a run of days where it had done nothing but rain. Then one day the sun came out. It was then that I wrote the title track, so what else could I call it?" Her music has appeared in many more smash hit films, including "L.A. Story", "Green Card", "Toys", the TomCruise/Nicole Kidman film "Far and Away" and Martin Scorcese's "Age Of Innocence". Enya's new song 'Only Time' will be featured in the upcoming film, "Sweet November", starring Charlize Theron and Keanu Reeves - it goes on release in February 2001. She has made appearances at benefits and has played for the Pope, the King of Sweden and the Queen of England, but these involved playbacks of her work while she played and possibly sang along, not a true live performance. "Itd be a really great thing to do, Enya says of performing live. Weve first been talking about next year, trying to at least do a TV special performance, having the setting, say, in a cathedral or something and involve quite a few people - orchestrating the music, having choir. Itd be fantastic to try. You cant emulate the same sound, but definitely the music can cross over to a rendering for a live performance. Were both very confident about that. Although fronted by Enya, the music released under her name is the result of collaboration between three people: Enya, who sings, writes and performs all the music, her producer, sound engineer and co-arranger Nicky Ryan and his wife, lyricist Roma Ryan. Enya has previously stated that without any one of them, "Enya" would not exist. This Enya Webring site is owned by YOUR_NAME.